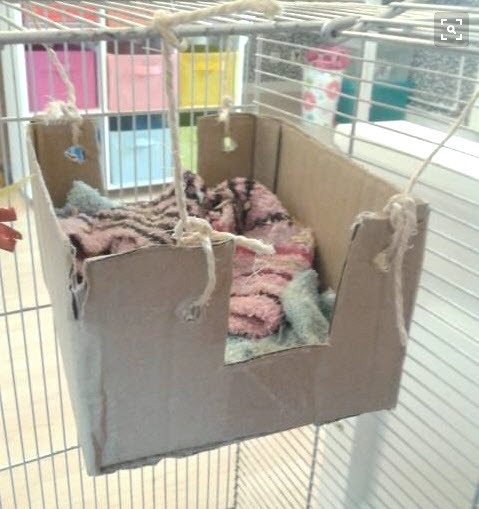 Make a hammock in your rat’s cage using a cardboard box! Get a cardboard box that is a good size for your pet rats. Poke a hole near each corner of the box, at least an inch or two from the top to ensure the holes won’t tear easily. Cut out a square from each side of the hammock where you would like there to be a doorway. Tie one end of a string through each hole, then use the strings to hang the hammock. Put small towels or pieces of fabric in the hammock for bedding, and put a ramp or something your rats can climb near the doorways of the hammock.